Mah Jong Quest Game Review - Download and Play Free Version! All the joys of Mahjong while rewarding your success with an unfolding adventure storyline! Stimulating game that enriches your mind. Quest element gives you goals which you strive to complete. Cannot create your own layouts. Pairing tiles can become monotonous. Quest mode presents Mahjong like you have never played before! Mah Jong Quest is an incredible game from the makers of Jewel Quest. 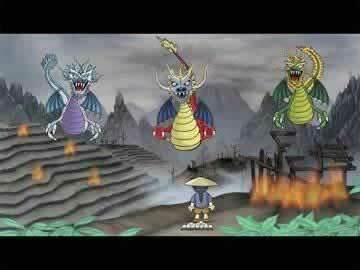 Help young Kwazi restore the land the Three Dragons destroyed. The quest will take you on an adventure of over 30 levels, only passable by completing Mah Jong boards. After each level, beautiful animation and dialogue will advance the story. Can you make it to the Dragon's lair and defeat the enemy harassing the peaceful land? Mah Jong Quest also includes 2 other game modes. In Classic, choose from 80 layouts to clear. The game keeps track of how fast you complete the levels so you can compete against yourself. Puzzle Mode also includes 80 layouts to choose from. New challenges and fun await you. Mahjong Quest, a take on the classic Chinese tile pairing game, is a great mahjong game that incorporates an adventure gameplay option. In this game you help Kwazi restore the countryside three dragons burned to a crisp. On your quest to restore the land you must complete different mahjong layouts that end in pairing the two sides of a ying-yang. Your success is rewarded with not only points, but a restoration of the charred land. Mahjong, for those of you not familiar with the name, is a Chinese tile matching game. Through pairing up like tiles you eliminate them from the game space. The goal is to eliminate all of the original tiles as quickly as you can. Playing with strategy is essential for success. You might want to get rid of as many tiles as you can early and then slow down and strategically eliminate pieces that will help you in the long run. Mahjong Quest offers different hints to help you if you are in a rut, however, these are limited so use them sparingly. There are two game modes in this tile pairing game. The first is a free-play mode that lets you choose from one of 80 different layouts with varying difficulty. The free-play mode is great for a casual player or someone just getting started in the game because you can choose your layout and difficulty. As you figure things out and your skills improve you can advance in difficulty by playing harder layouts. The second game mode is quest. 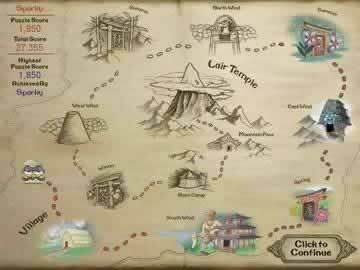 Quest is the more complete and adventuresome game mode. In this mode you must complete mahjong puzzles by pairing a ying-yang, in order to advance to the next levels and restore the destroyed countryside. There are roughly 30 levels on your quest that ends in the dragons' lair. The quest mode harnesses your mahjong skill through a fun and easy to play avenue. As far as drawbacks are concerned Mahjong Quest has a few, but nothing too severe. The game does not offer a multiplayer or an online mode. Interacting with other players online through a multiplayer game would enhance the overall quality. Also, unlike some games, you cannot download new layouts via the internet. If you could download different layouts or create your own the game would improve drastically and be one of the top games, if not the top game, on the mahjong game market. 80 layouts is a significant number and will certainly take some time to complete, however, more options through downloads or creating your own, would be a nice bonus. 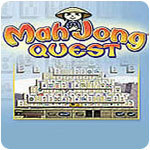 Overall, Mahjong Quest is a great mahjong tile game that incorporates adventure nicely. Though you will not be able to play against others, create your own layouts, or download them from the internet, this game is a top tier mahjong game. The adventure element adds a desire to play many other mahjong titles lack. Also, the rich strategic elements coupled with the enriching qualities make this a must play. If you are already a fan of mahjong or are looking for a good title to start playing, this is a great option for you. Video shows opening cinematic and first few levels of Kwazi's quest game mode.